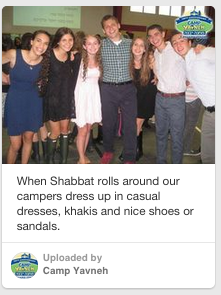 Camp Yavneh is on Pinterest! Summer 2015 is almost here and we know that camp prep is in full swing! We want to make preparing for camp as easy as possible for you, which is why we created a Pinterest board to help you with just that! Need help with Shabbat outfit planning, labeling your child’s clothes or organizing toiletries? Our board is full of great tips and tricks that will make packing easy and fun for your family. That’s not all we have on our Pinterest account! Do you love the traditions of Yavneh? Learn more about all of them on our traditions Pinterest board. We have decades of alumni photos and Zimriyah songs ready for you! If crafting is your favorite part of a summer at Yavneh, follow our crafts board! Here we are posting not only your favorite camp crafts, but also ideas for fun holiday crafts and easy camp DIY projects. The more creative the project, the better! Our last board features some of our favorite camp recipes! Everyone knows that Camp Yavneh has some of the most incredible kosher food and we want to use this board to help capture all of these fantastic recipes. We are always pinning new and fun ideas to our boards. Come follow us on Pinterest and see for yourself!